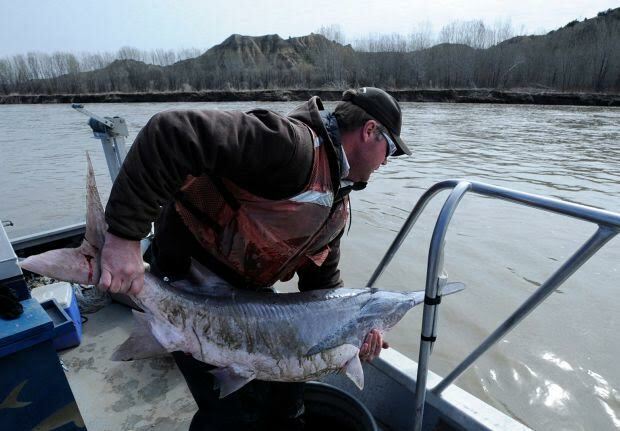 Paddlefish are Montana’s largest, and I think coolest, sport fish. The state record tops 142 pounds and was set in 1973 on the Missouri River. Paddlefish are native to the Missouri and Yellowstone watersheds, but dams have blocked what used to be long movements upstream to spawn. In 2011, however, high water flushed paddlefish over those same dams. One fish that was caught and tagged on the Missouri River in May 2010 near Fred Robinson Bridge was caught this fall on the Yellowstone River below Intake Dam. That means the fish was likely flushed over Fort Peck Dam in 2011. Many other fish living in Lake Sakakawea in North Dakota were flushed over Garrison Dam that same year.